The 1796 No Stars Capped Bust Quarter Eagle is a Key Date in United States numismatics. The first quarter eagles (face value of $2.50) were minted in 1796. Precise records were not kept of the earliest deliveries, but researchers have pieced together evidence to suggest that in 1796, a total of 963 quarter eagles with no obverse stars were produced, followed by another 432 having obverse stars. There was little demand for quarter eagles in the 1790’s: the denomination was too big for ordinary commerce, but too small for bank transactions. This explains the miniscule output of Capped Bust Quarter Eagles. The 1796 Capped Bust Quarter Eagle No Stars is one of the biggest attention getters in all of United States numismatics. It seems as if some collectors will pay any price to acquire a genuine example of this elusive key date. A long history of spectacular price increases is proof of its popularity. 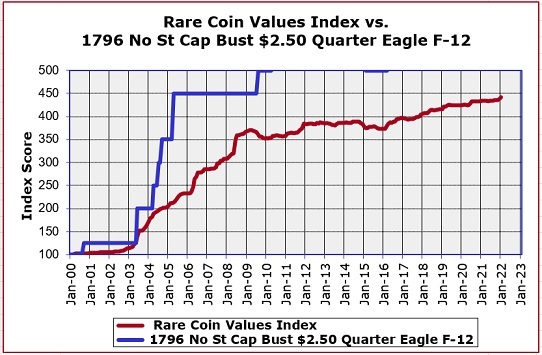 The blue line above shows the percent value increase of the 1796 No Stars Capped Bust Quarter Eagle (in F-12 condition), starting at Year 2000 as a baseline. As you can see, this classic US coin rarity has multiplied in value many times, attesting to its true scarcity and popularity with collectors. Expect more of the same in the future. Contrast the blue line with the red line, which illustrates the percent increase over the same time period of the Rare Coin Values Index, which measures the collective performance of a cross-sectional group of 87 rare US coins. The idea of the Index is to estimate the strength and direction of the overall rare US coin market. The 1796 No Stars Capped Bust Quarter Eagle is one of the 87 coins included in the Index. All data is updated monthly.